By the firm of Druids, Inc.
Would ship for Celtic gold. It weighed a million ton! What’s in your brochure’s pages. On a more serious note. Stonehenge: Eclipse Computer? But to predict eclipses, knowledge of two other cycles is required. One of these — the length of the lunar month — is easily determined. It is simply the number of days between one full Moon and the next. This cycle of 29-1/2 days is marked at Stonehenge by two rings of 29 and 30 holes, which together average 29-1/2. The other cycle, however, is of an altogether different character: it is a cycle of rotation of two invisible points in space. The evidence shows that the builders of Stonehenge probably discovered this cycle and could have used it to predict eclipses. These two invisible points in space are called the lunar nodes (from the Latin for “knot”). They are the points where the Moon’s orbit, which is tilted at a slight angle, intersects the plane of the Earth’s orbit. It would have taken many decades of watching countless risings and settings of the Moon to figure out the cycle of the lunar nodes. This information — which must have been passed on from generation to generation — is preserved at Stonehenge. All the Moon alignments necessary for determining this cycle are marked by massive stones. An eclipse can occur only when the Sun is close to being aligned with a node. By using Stonehenge to keep track of the position of the Sun and the nodes, these “danger periods” for eclipses can be predicted. A new (or full) Moon appearing during one of these periods would call for a special vigil to see if the solar (or lunar) eclipse would be visible from Stonehenge. A total solar eclipse would be a rarity. But the law of averages confirms that either a partial solar eclipse or a lunar eclipse can be seen (weather permitting) from the same point on the Earth about once every year. Why would eclipses have been so important to the ancient people of Stonehenge? Perhaps they considered the darkening of the Sun or the Moon a fearsome event — a celestial omen of doom or disaster. Many cultures have interpreted eclipses this way. But the sophistication of the astronomy of Stonehenge suggests that the builders had something different in mind. Their understanding of the solar and lunar cycles must have led to a high regard for the cosmic order. Eclipses may have been seen as affirmations of the regularity of these cycles. Or perhaps the unseen lunar nodes formed an element of their religion as invisible gods capable of eclipsing the brightest objects in the heavens. 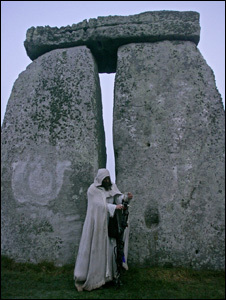 The idea that Stonehenge may have been a center for some kind of worship has occurred to many. It is not hard to imagine Stone Age people gathering at a “sacred place” at “sacred times” (such as solstices, equinoxes, and eclipses) to reaffirm their religious beliefs through ritual practices. 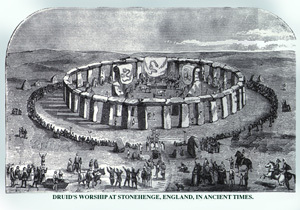 British antiquarian Dr. William Stukeley, who in 1740 was the first to note the summer solstice alignment at Stonehenge, advanced the notion that the monument was built by Druids to worship the serpent. He claimed that Stonehenge and similar stone circles had been serpent temples, which he called “Dracontia.” Could this serpent symbolism be related to eclipses? Recall that the key to eclipses is the position of the lunar nodes. The length of time for the Moon to return to a node (about 27.2 days) astronomers call the draconic month. (Draco is the Latin word for “serpent” or “dragon.) Perhaps the mythical serpents of Stonehenge and the legendary dragon that eats the Sun are symbols of the same thing: the invisible presence in time and space that eclipses the Sun and the Moon.